We will spend one full day exploring the city’s best museums and Buddhist temples. Overnight at hotel. In the morning, fly west to the Altai Mountains and drive to a Kazakh family for overnight in gers. Enjoy riding with eagle hunters and learn how Golden eagles are trained for hunting. Overnight in gers. Drive south to Tsambagarav, a worshipped mountain inhabited by ethnic Uuld people. Overnight in tents. We will hike in this pristine mountain valley. Try climbing to the peak and get bird’s eye view of the surrounding area. 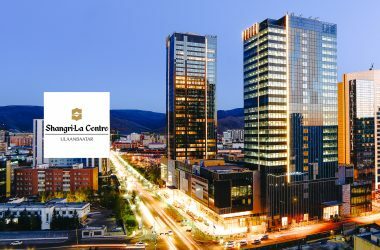 Early in the morning, we will drive to Hovd city and fly back to Ulaanbaatar. Overnight at hotel. Begin driving to the Orkhon Valley, considered as the cradle of Mongolian civilization. Visit Erdenenzuu monastery. Overnight in gers. 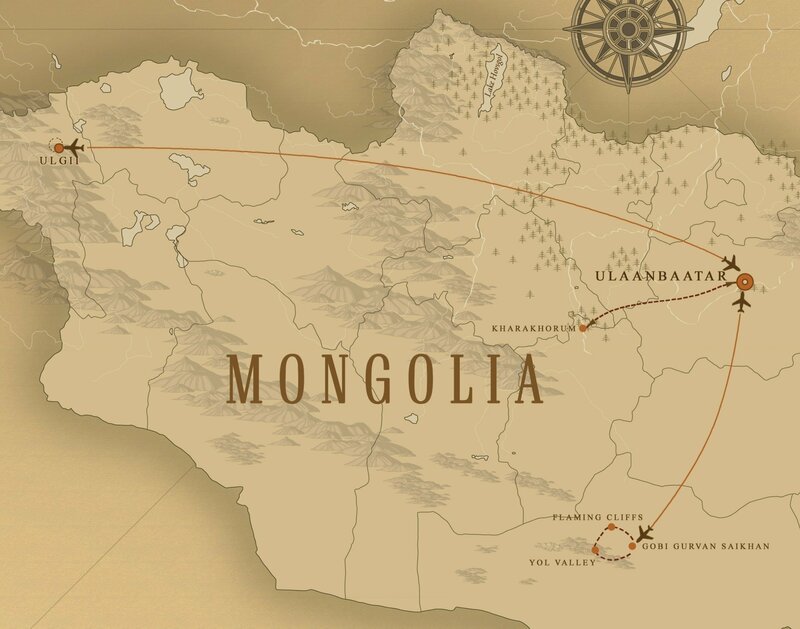 We will drive south to the Gobi desert and reach Ongo Monastery, located at the beautiful Ongi river. Visit the Ongi Monastery ruins. Overnight in gers. We will spend one full day relaxing and trekking along the lakeshore on foot. In the afternoon, enjoy riding in a small boat to explore the surrounding area from the lake. 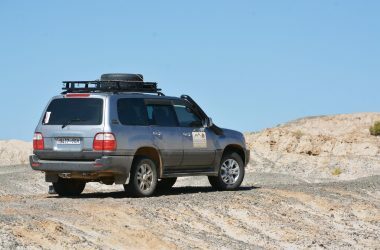 In the morning, we will drive to the Gobi Gurvan Saikhan National Park and visit petroglyphs sites. Overnight in gers. This morning, visit Yol Valley where ice stays until late July. In the evening, visit the legendary Flaming Cliffs nd enjoy Gobi’s sunset. Overnight in gers. This morning, we will fly back to Ulaanbaatar. Dinner at a fine local restaurant. This morning, we will visit the Gorkhi Terelj national Park and visit the Chinggis Khan equestrian statue. Overnight at hotel. In some areas, we will be staying expedition style tents. 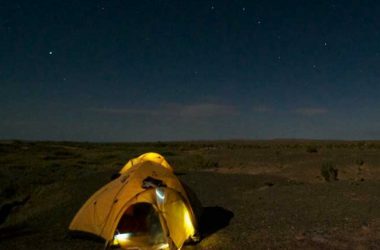 It is one of the best camping grounds in the entire country and be sure to watch for the northern stars and the entire Milkyway spanning over us! Throughout the program, we will be staying at ger camps, rustic, eco lodges. 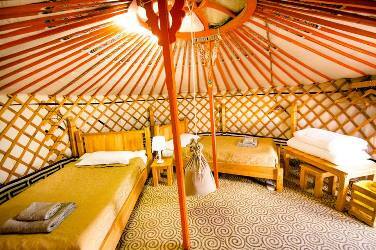 Ger camps offer authentic Mongolian experience.